The number above this agile monster gets smaller with every Medal you use. Once it reaches 0, it'll hit you with Sleep. 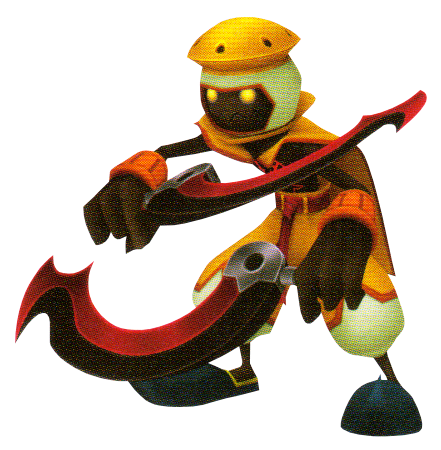 The Luna Bandit is an Emblem Heartless that was introduced in Kingdom Hearts II. The Luna Bandit has a thin, nimble body structure with dark brown skin and yellow, glowing eyes. It seems to wear a white balaclava over its head, orange bracelets, a flat, yellow hat, and a yellow-orange cape. It also wears baggy pants that are yellow-orange with white lower legs, a red, sash-like belt, and black boots with toes that curl upward. It has four-fingered hands and very thin legs and arms. The Luna Bandit's Heartless emblem is on its chest. 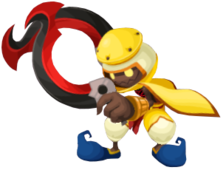 It wields two crescent-shaped scimitars that have silver guards and handles, red inner edges, and black outer ones; the hilts are screwed on, allowing them to be shifted around and to have the scimitars attached to each other akin to a chakram. 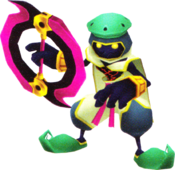 In Kingdom Hearts II Final Mix, the Luna Bandit's balaclava and its shoes are teal-colored. Its cape and pants are white and its hat and shoes are green. Its skin is navy blue and its gauntlets are a slightly lighter shade of orange. Its swords now have pink handles, gold guards, pink outer edges, and black inner ones. The Luna Bandit's name is derived from the term "luna", meaning, "moon" (possibly a reference to the shape of its swords, which resemble crescent moons), and "bandit", an outlaw. Luna Bandits are difficult to defeat, particularly because they often come in groups. Its quick attacks can also be very difficult to dodge. The best tactic is to block its attacks with Reflect, then attack while the Heartless are staggering.